Christmas yard decorations welcome others to your home by means of drawing the eye from the road to your doorstep. There are many Christmas yard decoration ideas to make this area a bright beautiful space. 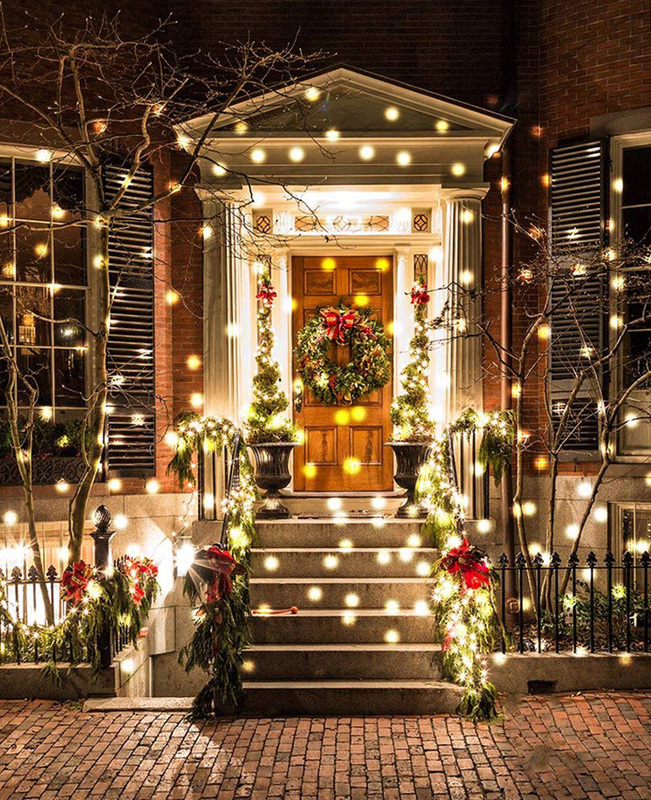 Decorate with lights, garland, and bows to really attract attention from friends and neighbors this holiday season. Fun DIY Outdoor Christmas Decorating Ideas include creating popular Christmas light balls. Placing various size balls of light across the lawn is an innovative Christmas yard decoration idea everyone loves. By wrapping Christmas lights around chicken wire balls, you can create a whimsical scene in your yard that leaves everyone’s jaws dropping. All you need for this DIY Christmas decoration is chicken wire, strings of LED mini lights, and wire cutters. Add Animation with a Tree of Lights: A tree of lights will shine brightly and be the focal point of your Christmas yard decorations. Using a basketball pole, C7 light strings, gutter hooks, a tree topper, and light stakes, you can make your own tree of lights. Alternate twinkle bulbs with regular bulbs to add animation to you tree. Decorate an Outdoor Christmas Tree: If your yard has evergreen trees, consider creating an outdoor Christmas tree. It will brighten up the entire yard. String mini lights throughout the branches, choosing a color theme based on your outdoor decorations. Be sure to string lights among the interior branches instead of just draping them on the exterior branches to make the whole tree brighter, and add ornaments to reflect light. Decorate with Topiary Animals: Lighted animals placed next to trees and nestled near bushes depict the warmth of nature during the holiday season. Create a group of elegant, grazing deer with these lighted creatures made of either grapevine or artificial greenery. Position them in a row to illustrate Santa’s reindeer team that pull his sled. Topiary animals are available in warm incandescent or LED light colors and in several differing heights so that they suit any area near your home. With deer that stand, graze, and lie down, you can also decorate throughout your yard with the animals to symbolize nature visiting your yard. Write Christmas messages with mini lights: Spelling out Merry Christmas in the center of your yard will make a statement, literally. Use black out caps to make spaces between letters. Make the words as large or small as you like. Use contrasting lights with the other lights in the yard to make your message stand out more. Animated Motifs: Another exciting Christmas yard decoration idea is an animated motif. These motifs come in all shapes and sizes with various themes. For large yards, consider a motif such as elves stuffing gifts into Santa’s stocking. With so many different motifs to choose from, there is sure to be one that will fit perfectly into your yard decorating style. I like how you mentioned that having animated motifs would be a good idea to have in one’s yard since there’s a lot to choose from which guarantees you’ll find one that would suit you. That’s quite timely since we are just about to go out and purchase some decors for our yard and garden. Having some animated motif would surely help us absorb the feeling of the holiday better. Additionally, some decoration in our garden that can tell some sort of story would surely be a good match for the animated motifs we’ll be getting for the yard. Thanks!